The Bible is clear about building upon sand. It is not a good idea. Houses built on a foundation of sand are not secure. Some houses built on the beach have vanished without a trace after one day in a hurricane. The sand is constantly shifting with the wind and wet and can offer little long term support. You can do a demonstration in your kitchen (or better, out on the porch!) which will show the effects of the winds upon the sands. One of the most common earth science experiments is the one in which the experimenter puts several sizes of dirt, stones, and sand into a jar with water. After the jar is vigorously shaken, it is put down and the contents are observed. What happens is that the solid material is laid down on the bottom of the jar in order of largest to smallest particle size. This shows that water carries materials according to the energy it possesses. Wind operates in a similar way. The harder the wind blows, the more energy it possesses, and the larger the material it can carry. Wind must have a great deal of energy of motion in order to carry solid things like rocks, but sand blows in the wind easily. Place a line of materials across one end of the pan about two inches from the end. These should be a clump of sand, one of dirt, a few little rocks, some fine little pebbles. Place the fan next to the pan facing into it. Turn the fan on low power and observe the results. Turn the fan on high power and observe. Draw a picture of the results at high power. Another demonstration shows what happens at the beach when the wind blows. Place the dirt in a ridge about 4 inches from the end of the pan. Put sand next to the dirt 3 inches from the end. Place the little plant in the dirt as if it were planted there. Place the pebbles and rocks around the ridges. Place the fan at the end of the pan as shown. Turn the fan on high power and observe the results. Notice especially the patterns the sand makes after being carried by the wind. How do the objects affect this pattern? 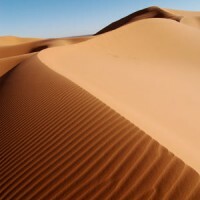 In the above demonstration, you should be able to create some sand dunes. In another related activity, you could mix up the dirt and sand before letting the fan blow. While the presence of dunes is characteristic of beaches, dunes in other places destroy the ecosystem in the area. 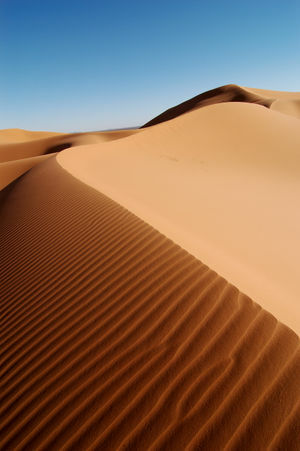 A subject for further research is the encroachment of the sand of the Sahara. The Sand Dune National Mounument in the United States is another, smaller example of moving sand. The effect of the wind and the denudation of the soils was graphically evident in the 1930’s on the plains of the United States. You can use these topic areas to take your research to the library or internet and learn more about sand. Have fun! Glad you are finding it useful!